It's likely that paying rent for your telephone booth-sized apartment feels like the financial equivalent to selling both your soul and your first born child to a faceless real estate company, month after month. But what if we told you someone wanted to offer you a full-fledged home, to own -- and you could hold onto your first-born? Right now, the Japanese government is launching a program to help fill some 8 million abandoned homes throughout the country, and they're offering each at next to nothing, or for nothing at all, according to a report by Insider. So what's the catch? Well, there's the obvious point that you'd be required to move to some remote region of Japan (though there are a handful of properties just beyond city limits). But in addition to that, there's the added fact that a number of violent or unnatural deaths took place within the confines of these homes, which isn't typically a good selling point for real estate agents. Because many of these homes were vacated as the result of natural disaster, they come along with horror stories. In short, the potential for serious haunting is rather high. According to a report by the Japan Times, 70% of Tokyo's inhabitants live in apartment buildings. As a result of urban flight, folks aren't settling outside of major metropolitan areas, anymore. That said, a free home is a free home. And if you're willing to commit to a longer commute, you can escape the confines of city living and return home each day to a building you can actually fit inside of. Novel idea, huh? Apparently, the country is so desperate to pawn off some of this uninhabited real estate, the government is also looking to provide funds to buyers for the renovation of properties that are particularly dilapidated. 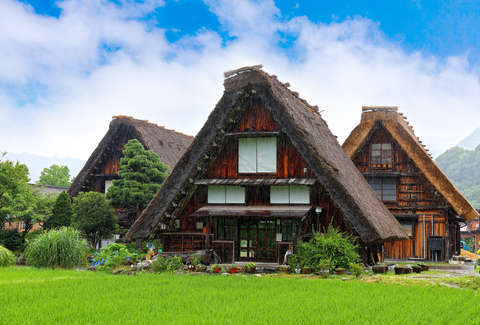 So if you're a prospective home-buyer and you don't mind the occasional ghost, a once-abandoned Japanese property awaits you.